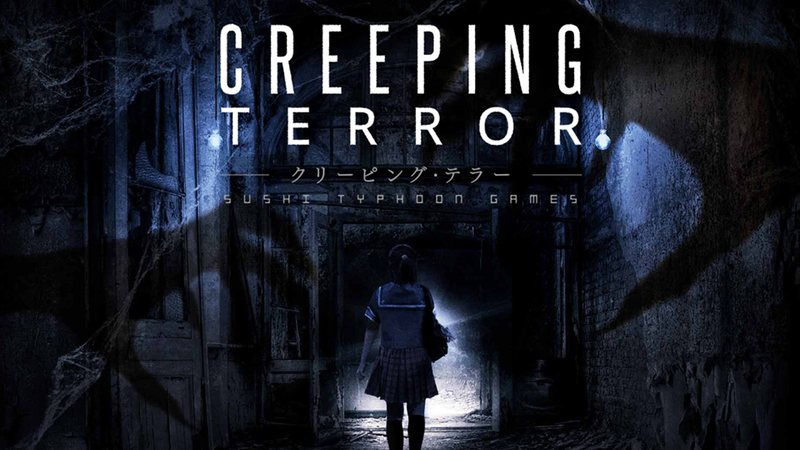 I’m probably the last writer at oprainfall who should have reviewed Creeping Terror. Not because I don’t like horror, mind you. I’m inexplicably drawn to it and find it fascinating when done well. No, the reason it shouldn’t have been me is because I’m easily terrified. Of the dozen or so horror games I personally own, I have beaten about four of them. I get drawn in early on with the chills and thrills, and those same scares later have me cowering in a corner (figuratively speaking). It actually took me a year to beat the original Dementium after I started it, and that’s like a 6-hour game, max. But I wanted to prove to myself that I could improve my track record, so I took it upon myself to review Creeping Terror. Published by Aksys and developed by Nikkatsu, mebius and Sushi Typhoon Games, it’s the story of a group of friends who go to a rumored haunted house and quickly find things spiraling out of control. The question is, was Creeping Terror the perfect game to motivate me? Or should I hide it in the corner of my room? The game starts out pretty calm, with notes of Scooby Doo camaraderie between the group of Arisa, Bob, Emily and Ken, but then gets tense and creepy very fast. Early on protagonist and affable exchange student Arisa gets separated from her friends and finds herself waking up in a mysterious cavern. Here the game teaches you how to interact with the touchscreen and basic controls. You can access them either by pressing X and then using the D-pad or by using the stylus, but when I was in a hurry, I used X since doing so freezes whatever is currently happening, which can give you some much-needed breathing room. Using either control setup, you can access 4 things – your inventory of usable one time items, key items (which work automatically in the right situation), informative files and your handy map. 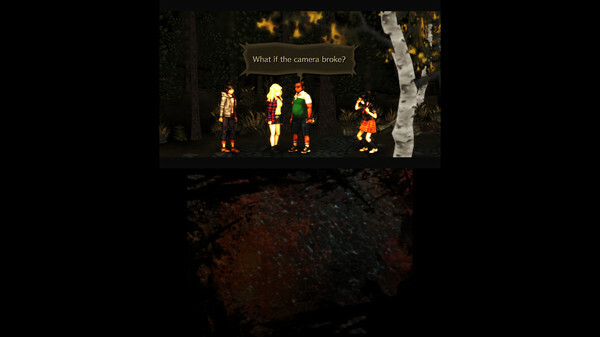 The other key element of gameplay is making use of limited light to navigate shadowy corridors. Your only source of light is an app on Arisa’s cell phone. The catch is, as you use it, the battery slowly drains, and once it’s depleted, you’re literally in the dark. Besides making things harder to see and inherently creepier, the darkness works against you physically. When you have the light on and run across some debris in the path, you will automatically avoid it, but if the light’s off, you’ll trip over it. Which wouldn’t be a problem if it wasn’t for the last aspect of gameplay – the chase sequences. C’mon Arisa, just let the nice man show you his shovel! There are plenty of pulse-pounding chases peppered throughout the game, and there are various antagonists which want nothing more than to corner and murder you. Being that this is a horror game, you can’t kill these foes (you can stun them temporarily if you have a stone handy), but can only escape and hide from them. 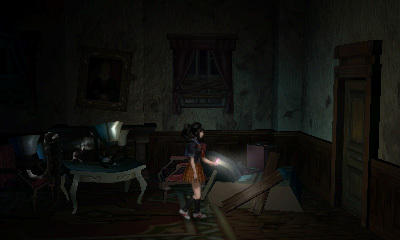 As you walk through the game you will come across designated hiding spaces, and all you have to do when you encounter them is press A, and Arisa will turn off her light and duck and cover. However, if you don’t hide fast enough, the foes will find you, and if you don’t wait long enough for them to leave the room, they will resume their attack. Thankfully, there is a saving grace, and that’s the evasion skill. When a foe catches you, it’s not instantly game over. You’re given a chance to rapidly press the A button to throw them off you and temporarily stun them, letting you run for cover. However, you can’t rely on this, since successfully evading them costs you stamina, and while being chased, your health and stamina are the same meter. Essentially, that means that each time it will get harder to fight back and harder to run away from them. So your best bet is still to run and hide quickly. For that reason, it’s very important you keep mental track of hiding spaces you find and dashing to them when you need to get away. You can do so by holding R to run, but that drains your stamina as well, so it’s a delicate balance of cat and mouse. Though the map is small, you can use the stylus to maneuver around and see interconnected rooms. You can also use the tabs to open up maps for other areas you’ve explored, which is quite handy for when you need to backtrack. I appreciated that the map has icons to show you which doors are locked and which corridors are impassable. Most importantly, the map keeps track of the rare safe rooms, where you replenish your health and phone charge automatically whenever you return. My one complaint about the map is that it doesn’t identify hiding spaces, though I can understand that perhaps doing so would take away the element of horror when being chased. However, I would have appreciated some notepad functionality so that, if a player wanted, they could denote key things about rooms themselves. One way that the game exceeded my expectations is that you can save your game at any time, so long as you’re not being chased. 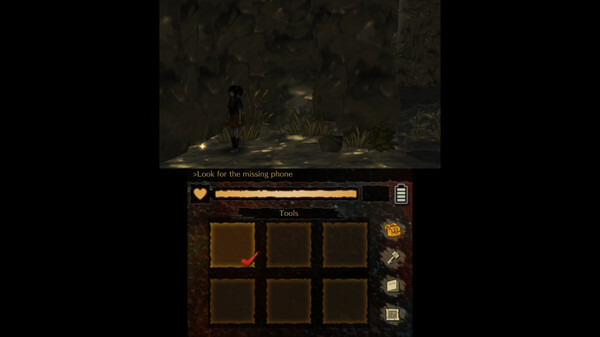 This makes the game feel more open-ended and helps give you the freedom to explore, though if you get lost, you can check your current objective on the top of the touch screen. For better of or worse, Creeping Terror hearkens back to old-school horror with a limited inventory (you can only hold 6 things at a time) and no discernible way to store extra items. Furthermore, items can be used even if you don’t need to, so be extra careful with food rations and phone chargers. I would have even appreciated the option to drop items I didn’t need on the floor, to help make room for others. Another tribute to horror games of yore are the many files you’ll find scattered around. These vary from newspaper clippings to journals and more, and they provide great backstory to the sinister events surrounding the story. I won’t ruin anything, but there is a lot more going on than just a haunted house, and the deeper I got into the game, the more intrigued I became. Best of all, there are multiple endings to the game. I only got the basic ending and wasn’t able to resolve all the plot threads satisfactorily. So if you find yourself getting drawn in, you’ll have some replay value to keep you going. In a game like Creeping Terror, atmosphere is everything, and I’m happy to say it delivers. The heavy darkness that coats every surface makes it so you never feel truly safe, and the adept use of lighting provides fantastic contrast. I also like how the game uses occasional visual cues to warn you of impending danger, such as fog rolling in. However, don’t make my mistake and get cocky, since the game does keep you on your toes by playing with your expectations on a pretty regular basis. While the game isn’t visually stunning, neither is it ugly. It merely makes use of what I refer to as PS2 graphical standards, which is fine for a portable experience. However, one area that I was blown away was the 3D. I rarely use the 3D toggle on my 3DS, so you can imagine my surprise when I turned it on and found it enhanced all the things I most enjoyed about the game. The tension and menace are palpable with the 3D turned on, and it served to make the experience more enjoyable and polished. While you can pick the game up on Steam, for this reason alone I would recommend you get it on your 3DS. On the sound side of things, the game mostly does a good job of keeping you startled and wary. 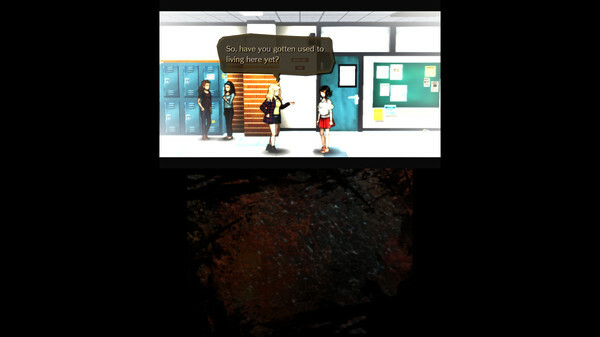 The ambient noises, such as whistling wind, creaking doors and even the heavy pad of Arisa’s shoes help draw the player in. I like how there is no real urgency to the music until a chase occurs, which cranks the energy all the way up. The only sound that felt out of place to me was in the Mansion area, and it’s what I refer to as the “purring flatulence” sound effect. I can’t describe it better than that, but you’ll know it when you hear it. It didn’t ruin my immersion, rather it provided a release for my stress as I cautiously made my way around, trying to avoid contact with constant threats. And while the game doesn’t include voice acting, it has surprisingly solid localization. There are no hokey misspellings that take away from the mood, and I’m very happy about that. Overall, Creeping Terror was a revelation in my horror gaming experience. In my 4-hour playthrough, I was constantly on edge, yet kept putting one foot in front of the other in my attempt to find out what was actually happening. Though I did manage to get Arisa safely home, I didn’t get the best ending, so I will assuredly be playing it again very soon. 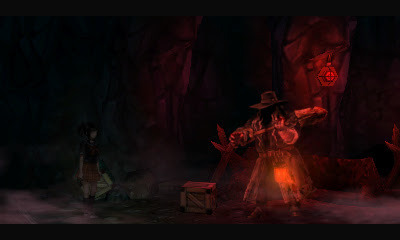 If you’re a fan of horror and own a 3DS, Creeping Terror is a bargain at $8.99. Aksys has published a winner here, and I hope they continue to bring over unique and creepy titles.